Florence without the Medici family in its past would not be the Florence we have today. There were certainly other wealthy families in Florence that were patrons of the arts but none to the extent of the Medici dynasty. Under the Medici, Florence became the “cradle” of the Renaissance. Palaces and churches were built for the family and then everything from tapestries, furniture, household objects and paintings and statues were commissioned to adorn these palaces and churches. As rulers of the city, the Medici had to show off their power to impress not only the citizenry but other powerful rulers throughout Europe. The Medici dynasty ended with the death of Anna Maria Luisa de’ Medici on February 17, 1743. Before her death, she created the “Patto di Famiglia” where she willed all personal property of the Medici family to the city of Florence with the explicit condition that none of the Medici artistic patrimony was ever to be removed from the city. 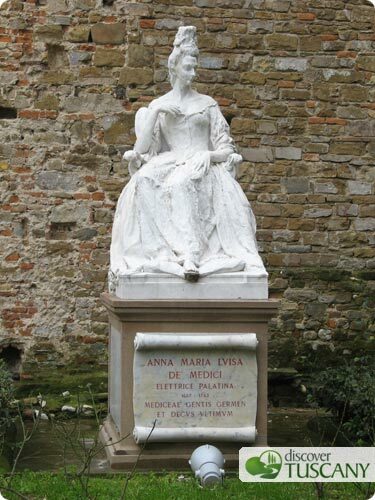 Florence, in honor of its most important benefactor, dedicates February 18 as a day of celebration to Anna Maria Luisa. Starting at 10.40 am, a historical parade goes from Piazza di Parte Guelfa towards Piazza della Repubblica, crosses Piazza del Duomo to arrive at the Medici chapels in Piazza di Madonna degli Aldobrandini. Here at 11 am, a floral wreath is placed on her tomb. The historical parade then returns to where it had started. This year a book dedicated to Anna Maria Luisa will also be presented in Palazzo Vecchio’s Salone dei Cinquecento at 5 pm. In honor of this special celebration, all communal museums will be open FREE of charge on February 18. It does NOT seem that State Museums will be included in the celebration, which include the Uffizi, Accademia, Bargello and Pitti museums. You never know, if you visit these museums on that day you could be surprised to get in free of charge!